Sarah and David came up for ideas for the JAMPIRES book by having a COMICS JAM! 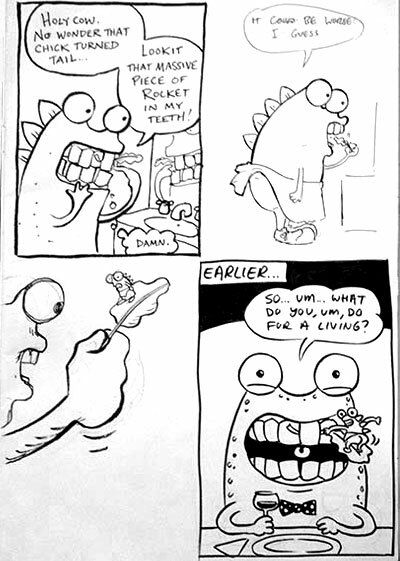 A comics jam is when you take it in turns with someone else to create a comic, one panel at a time. It’s improvised, so you don’t know how the story will turn out! 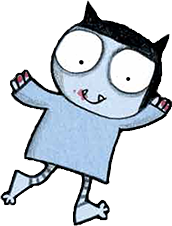 You can see the comic Sarah and David made here. 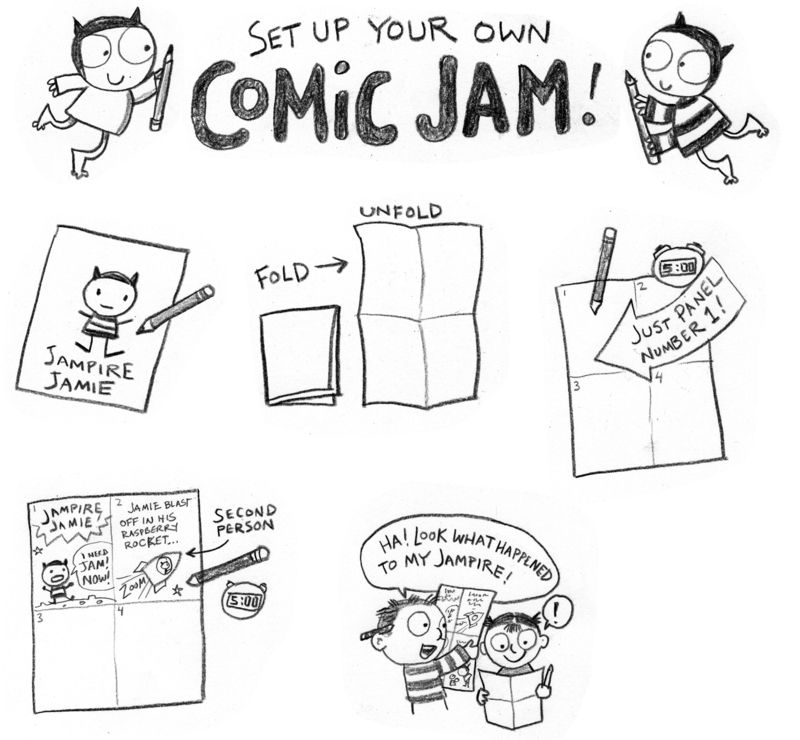 Why not have your own comics jam? 1. Find a friend (or someone in your family!) who wants to draw and tell a story with you. You need at least one other person, but you can have as many people involved as you like. Time limit: how long should each person spend on their panel? Five minutes? An hour? Theme: pick a theme to help you get ideas. Or you might start instead with a character you’ve created. Length: decide how many panels or pages your comic will be, so you know how close you are to the end and can start tying up those loose plot threads! For example, a four-panel limit is a handy length: it can be a simple piece of paper divided into quarters. Total freedom: don’t tell the other participants what you’re drawing. Give them a surprise! Publishing: Are you going to share your comic? You could post it to a blog or email it to someone else. Or photocopy it and give copies to friends. You don’t have to share your comic, but if you want to make it into a printed book or post it on the Internet, it might help to work at a handy size. 3. Go for it! Who goes first? Start jamming! 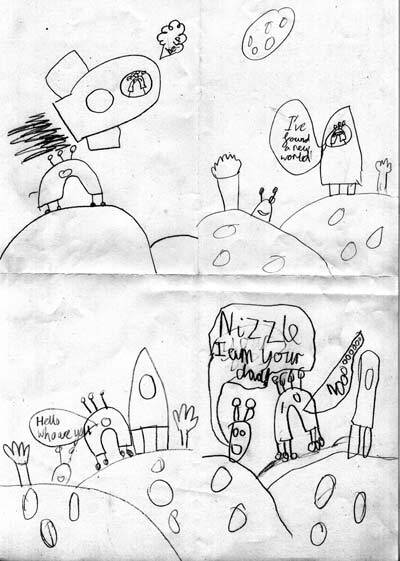 Help your kids to make awesome comics! 1. Explain how speech bubbles and thought bubbles work. 3. Remind them to show their characters’ setting. Where are they? What are they standing on? 4. If they finish very quickly, encourage them to add textures, patterns and colour. Tell them to add more detail to the background, or quirky extras (such as fly buzzing around, or another character seen through a window). 6. Encourage them not to confer with each other about their drawings, or you’ll get kids who never even start their own panels. Explain that they’re setting their character off an adventure, and once that character’s gone, it’s out of their control. 7. If the page they’re looking at is confusing, help them try to imagine what MIGHT have been happening in the earlier panels, and use even a small detail as a jumping-off point for the next panel. It’s a great way for kids to start to realise what a story requires to be understandable to another person, not just make sense in their own heads. Participants with special needs, particularly those on the autistic spectrum, can still take part in making comics but they may enjoy the activity more if they continue drawing on the same piece of paper instead of swapping papers. 1. When Sarah and David lead Comics Jams in schools, often they lead everyone in creating a character. 3. They set a time limit of 5 minutes per panel, and at the end of 5 minutes, everyone passes their comic the person on their left and starts on the next panel of the new comic in front of them. So the overall session may take 50 minutes to an hour, but the final Comics Jam takes exactly 20 minutes, with a bit of extra time at the end for everyone to get their comic back and find out what happened to their character. 4. We ask the kids, ‘Did you like what happened in your story? Do you think you would have done it differently?’ Either way, the comic can inspire them to take the characters on to further adventures, either by themselves or working together in further Comics Jams.